Though all hopes of snow in our part of Texas were lost by Friday afternoon, we can always seek winter solace in the pages of a book. 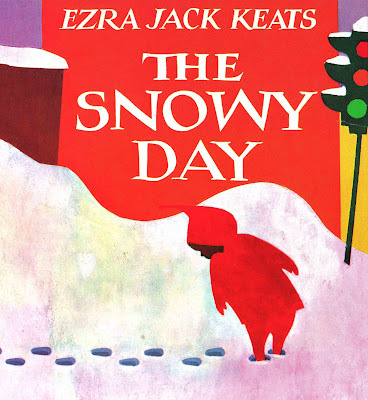 To celebrate the fact that it does indeed snow somewhere in this wonderful world of ours, the Great Monday Give for today is a great, kinda-new hardcopy of the classic favorite by Ezra Jack Keats, The Snowy Day. To be entered to win, all you have to do is leave a nice comment on this post before Sunday, December 13 at midnight. Now, the winner of the Thanksgiving Give.... a copy of The Velveteen Rabbit is.... Claire! Congrats and send me your info to webe(at)soon(dot)com to help facilitate the sending of your winning. So long! Thanks for doing this blog. As an expectant father it is a great help. I'm sure I'll be checking back often. LOVE your reviews and thanks for all the giveaway chances! My kids (5 & 2) would love this book. Oh my gosh, this books just makes me giddy for some reason. Please include my name in the drawing. My son is 8 and probably too old for it,but I'm not! My kids would love to own their own copy of this one! Wow! Today is the first day snow is sticking outside my window. . . what a perfect day to win this book! I'd love to have an extra copy of that to give one of my nieces' teachers, sure. It is so easy to leave a 'nice comment' on any post you write. Your blog is one of the few that I must read every day! Ezra Jack Keats is little known here is Australia, but his name turns up regularly in lists of classic kids books and authors. I would love to actually see and read one of his books! Thank you for writing your incredibly useful blog. I enjoy it very much. Oh, I love to look of this book and it also makes me want it to snow! This book is an absolute favorite at our house. The illustrations are just so perfect and evocative. And it's winter-themed! I'd love to be entered to win. Oh! Please! I missed the twelve snowflakes we got here in Austin, and I would love to read this book to my child. Ha! We love new books in this house, though we can't afford to buy many! We loves Henkes, Rohmann, Weisner, Joyce (Santa Calls is my favorite holiday title) and tons more. My son has a weird Froggy fetish too, so there. We don't even get to hope for snow around these parts. We'd have to go miles and miles, and then up a mountain, and then hope. Also, our thrift shops aren't all that (or even a little of that). So please pick me! All your great Christmas reviews have me dreaming of white. I'm sorry you don't have white Christmases in Texas, but be thankful it is not 12 degrees, as it is here at my house. Sometimes, even with snow outside, it's best to enjoy the snow in a book. We have Keats' book The Little Drummer Boy and it's beautiful. I'd love this! This book sounds wonderful! I would love to read this book with my kids. Please enter me in this giveaway. possibly my all time favourite 1960s American picture book. I bought an extra copy and mounted the final DPS as a picture on my wall.